For the 2017 Tour of Flanders, the iconic Kapelmuur will once again feature. The 1964 hit, Chapel of Love by the Dixie Cups of New Orleans is among the most iconic songs of all time. 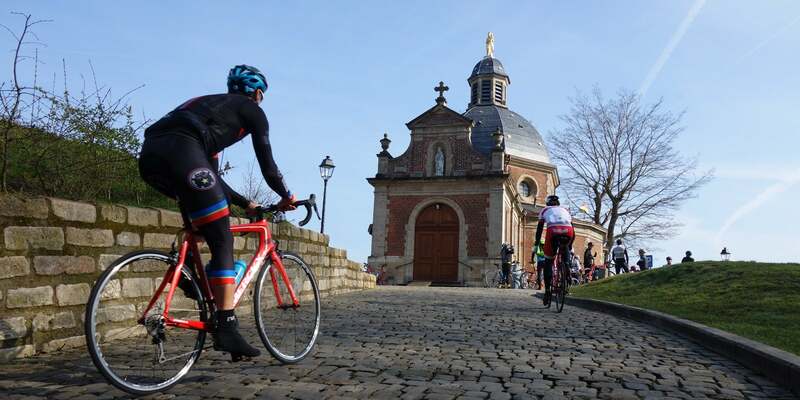 The “going to the chapel” refrain, albeit in Flemish, is echoing throughout Flanders as the Flanders Classics race organization has announced that the parcours for 2017 will indeed return to Geraardsbergen and that iconic climb, the Kapelmuur, or Muur van Geraardsbergen, is back. RELATED: Relive the action from last year. Flanders Classics announced both a new starting city, Antwerp and with that change, a return of the Muur. The change to Antwerp means that the Ronde is leaving behind Bruges; its starting point since 1998. That however has been the nature of Belgium’s greatest race. From 1913 to 1976 the Tour departed from Ghent, after which the start was relocated to East Flanders’ Sint-Niklaas from 1977 to 1997. Now Antwerp will take its turn, confirmed, until 2021. What has not changed is the race’s finale. That the Muur will make it’s mark on the race is no doubt, but the real action will still happen in the bergs and cobbles around Oudenaarde. The finale will once again be comprised of Oude Kwaremont (2nd time), Paterberg, Koppenberg, Steenbeekdries, Taaienberg, Kruisberg and for a final trip, the Oude Kwaremont Paterberg duo.